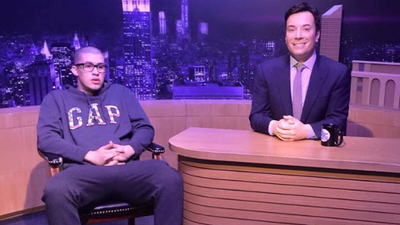 Native Puerto Rican, Bad Bunny who's real name is Benito Martinez Ocasio had made a rare appearance on The Tonight Show Starring Jimmy Fallon to perform in front of the live audience and millions who watched on television. He started off saying in English: "After one year of the hurricane there's still people without still without electricity in their homes. More than 3,000 people died and Trump is still in denial. Well you know what..."
After he speaking to the audience, he starts his performance of "Estamos Bien" in front of video of Puerto Rico playing on the screen behind him.